Depending on the age of your kitten, they may need a special kitten diet – and eat more often than an adult. They also need vaccinations. Depending on age, their sight and hearing may not be fully developed. Talk to your veterinarian for advice. Kittens burst with energy; they want to explore, and may get into trouble. 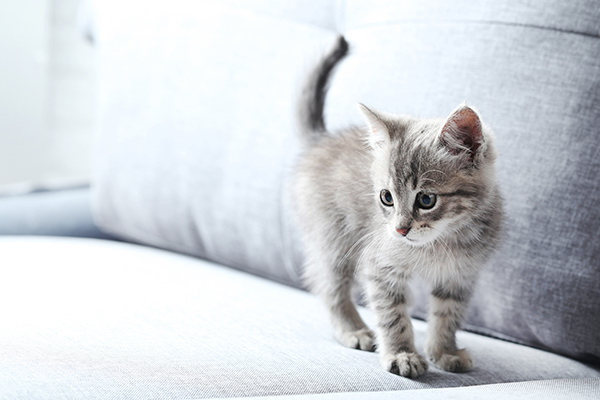 Make sure you have kitten-proofed the areas of the house your kitten will have access to. A kitten between two and four months of age will have about three times the energy of an adult cat. It is often easier to have two kittens than one – they entertain each other and can enjoy the other’s company for the rest of their lives. Many worry about exposing their kittens to new situations, but this is a time in life when socialization is more important than ever. Exposing kittens to new experiences will help them adapt and learn, and prevents them from becoming nervous as adults. Spend a lot of time with your kitten. Pet them and let them become used to being handled. Do a weekly combing and grooming session, and make sure to touch the kitten’s paws. Getting used to it as a kitten will make it easier to brush the adult cat, trim the cat’s nails, and similar. Give your kitten fun objects to explore, like a cardboard box or a paper bag. Provide scratching posts and reward with praise or treats when your kitten uses them. Don’t let your kitten bite or scratch you when playing. Withdraw without punishing or reprimanding, and reward good things. Practice using the carrier and let your kitten know it’s a positive and friendly place. Keep the pet door closed, or keep your kitten away from it. The world is filled with dangers for kittens – and they might never find the way home again.